Comic-Con is the nation’s largest convention. It attracts fans not just of capes and cowls, but also genre fans. This year, New York Film Academy cinematography teacher, Bart Mastronardi, spoke on a horror panel about his forth-coming film Tales of Poe. Mastronardi took some time to tell us about his experience and what makes Comic-Con a great place to showcase your work. Can you tell us a little about your film? 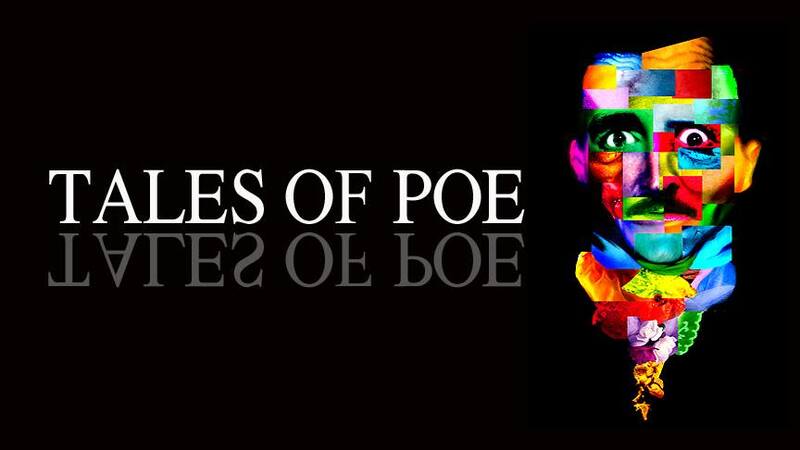 Tales of Poe is an anthology film based on the works of Edgar Allan Poe. I wanted to make a movie using Poe’s stories in a cinematic way that has not been used before. The cast is made up of the horror genre’s best: Amy Steel (Friday the 13th part 2); Adrienne King (Friday the 13th part 1); Caroline Williams (Texas Chainsaw Massacre 2, Sharknado: The Fourth Awakens); Lesleh Donaldson (Happy Birthday To Me, Curtains); Debbie Rochon (Satan Hates You); along with Randy Jones (The Village People). We spent four years making the movie on an independent budget. 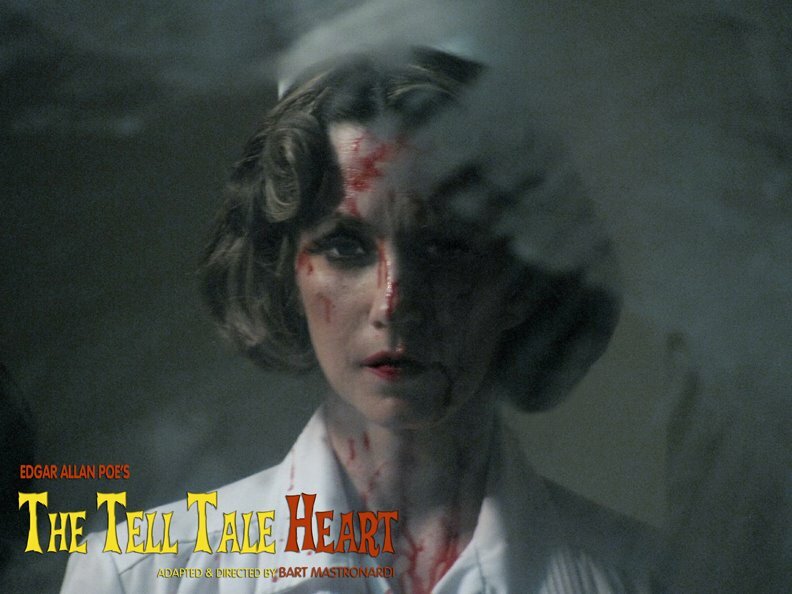 I chose three of Poe’s works for filming: The Tell-Tale Heart, which I wrote and directed; The Cask of Amontillado, written and directed by Alan Rowe Kelly; and Dreams, which I directed and was adapted by screenwriter, Michael Varrati. I produced the film with Alan Rowe Kelly. What did you gain from showcasing at Comic-Con? A large amount of exposure and attention. Showcasing Tales of Poe at Comic-Con helped to gain a lot of attention to the movie including the cast and us, as filmmakers, too. Tales of Poe is an independent film in the horror genre so being asked to attend Comic-Con was an honor. It allowed the film to be seen on a large- scale platform and reach a broader audience. Our numbers began to increase in regards to publicity. Being at Comic-Con is, to a degree, equivalent to being at the Academy Awards. That is how big Comic-Con is. It’s immensely fun to be there as a fan and buyer, but to be there as a guest will draw audiences to your work, which is what you want it to do. What are your future goals for this film? Actually, Tales of Poe is going to be distributed this October 11th from Wild Eye Releasing on DVD, VOD and other platforms for viewing for North American sales. We are also focusing on international platforms, too. 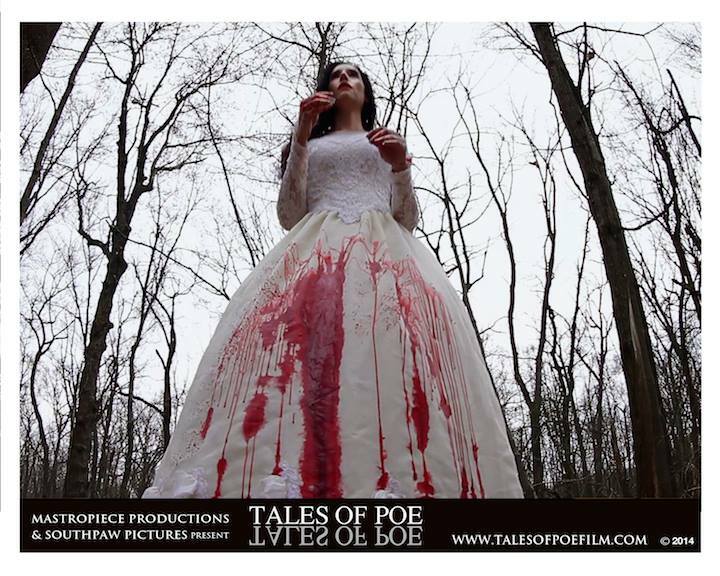 We do have a Tales of Poe poster and DVD signing with some of our cast and crew at Dark Delicacies in Burbank and in NYC at Forbidden Planet closer to the film’s release date. The film is in great hands with Wild Eye Releasing as they have been publicizing the film outside of the genre and within the core genre markets. It has already had its premiere and festival run for two straight years. We are all excited about the new journey the movie is taking this October. Tell us about how you got into filmmaking? I always loved movies not so much television, but movies. I watched all the black and white Universal horror movies. Frankenstein was my favorite. My dad always took me to the movies when I was a kid. I grew up in Queens, NY. Movie theaters were all over the neighborhood. He took me to see Star Wars when I was five years old and boy did that the film have a huge impression on me as a kid. When I was twelve my dad took me to see Friday the 13th: The Final Chapter in 1984 and that solidified my love for filmmaking and the horror genre. I hadn’t seen anything like it before. It made me excited about movies even more. I knew then, filming and horror would be my future. I began to read “Fangoria Magazine”. I still do. I went to the Weekend Of Horrors Conventions and met my favorite horror celebrities. I wanted to be a part of the world. I knew that many people wanted to be directors, so me being a photographer, I studied cinematography, which led me to get into a great independent horror community in NYC. Then, I met filmmaker, Alan Rowe Kelly, and he formed this great friendship that led us to be business partners, which led to Tales of Poe. 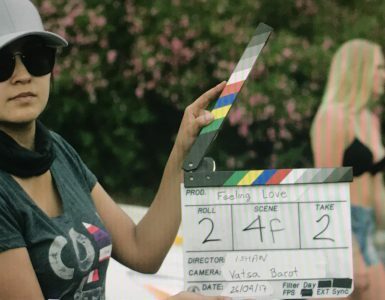 As a director, I approached my films on a personal level. This means I financed them myself for artistic means. My first film, Vindication, took 4 years to make and I was honored when the great horror master, Clive Barker, reached out and attached his name to Vindication with an incredible review. His touch opened so many doors for me. It brought a larger budget and reputable name actors to Tales of Poe. Because of those connections Tales of Poe has a Hollywood premiere at the Egyptian Theater on Hollywood Blvd and at the NYC Horror Film Festival at the Tribeca Movie Theater. What advice would you give to students interested in showcasing their work at Comic-Con? Do it! But, do it with purpose! That means you go with posters, characters dressed up, T-shirts, bags, cast, crew, business cards. Find out who will be there in regards to publicity and ask them for interviews, platforms to showcase, panels to speak on if you can. Use your social media to the film’s advantage. Social Media is the best form of free publicity and it gets the word around fast. Comic-Con is not a film festival so don’t think you are selling the film. What a filmmaker needs to do is publicize and market the film. Comic-Con will help you find an audience who enjoys genre works of all kinds. You will reach an incredible amount of people. What filmmakers must understand is that Comic-Con is for a specific audience. You will not gain interest marketing your latest drama. Comic-Con focuses on specific genre markets. These are the markets I work in as it interests me as a filmmaker. To be an invited guest to speak as a director and showcase Tales of Poe at Comic-Con two years in a row has only benefitted the film. I am honored to be there, but I also know what I had to do to help get the interest for Tales of Poe out there. What is the networking scene at Comic-Con like? Networking at Comic-Con is incredibly insane and intense as there are many talented people there showcasing their work and art on so many levels. Comic-Con represents the best on a visual scale. It is colorful, loud and big with so much going on in the area. You walk around and something is being promoted in and out of the convention center. The trick is to be prepared to network with as much as you can bring to it. If you go to Comic-Con as just a fan to look around, buy merchandise and see what it offers then great. If you are going for networking then you must bring your game face. What was it like speaking on a panel at Comic-Con? It is an honor and so much fun. I have to thank Michael Varrati for asking me to be a part of it. I was there to talk at the biggest, most attended comic book genre convention in the world as an independent filmmaker in the horror genre for Tales of Poe. Talk about it all coming full circle at that moment from being that kid watching Star Wars and Friday the 13th to speaking at Comic-Con. Aside from being excited as a fan, being there gave me a platform to discuss the issues the horror genre faces and how Tales of Poe is a part of those issues, too. The panel is a great way to have a dialogue with peers and audience. A filmmaker’s presence at events is important in getting the word out there. Audiences want to know what we have to say outside of print. My presence allows them to meet, greet, and hear what I have to say. It’s a personal thing for audiences to meet and hear the filmmakers as it connects them to the film a bit more. I enjoy the publicity and getting out there to talk to audiences about my work. At Comic-Con it means so much more to me because I love what Comic-Con is. I was that kid who grew up on comics, genre, and fan-fare. How important are signings like this in getting your project to the intended audience? It is important if you are looking to draw more of an audience to see your movie and get the word out there to be present. Audiences love it when the actors and filmmakers show up to talk, sign, and take pictures. For me it is fun. I also know it is important to understand that art is what we as filmmakers bring to our work. But, at the end of the day it is business particularly once distribution gets involved and money exchanges hand. If I want to be a part of something then I have to put myself out there to get the intended audience to see what I have produced. Tales of Poe is a very important film to me. I spend four years of my life with Alan producing and directing it to get it out there. I equate it to being a parent. When someone has a child you must raise it, educate it, feed it, clothe it, send it to school and do all the things that are important to helping it grow and experience life. The same is with a film. I make movies to fulfill my own artistic needs, but once I am completed with the film it goes to the audiences. They then watch it, giving the movie a new life. It’s a great journey if you want it to be. The signings help the film reach an audience on a personal level. Combine that with good social media and the word spreads fast. If the audiences publicize it right away, and if they love it they will talk about it even more. It gets the buzz about your film heard. Do you plan on going next year? Why or why not? I was planning on going next year as just a fan of Comic-Con. Spend the weekend in San Diego to feel the excitement on a different scale. For two years in a row, I was invited to speak and promote my work. Next year, I would love to go just to go, enjoy San Diego, and be that kid again. But if invited again I would certainly go. I literally just moved from NYC teaching at NYFA in NYC to Los Angeles to teach at NYFA full time. 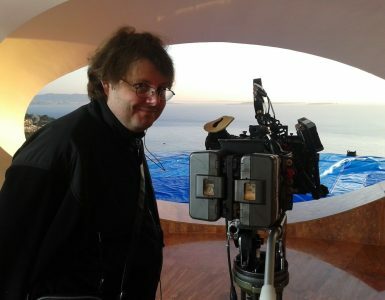 Much of my time is devoted to educating young filmmakers on the understanding of filmmaking through cinematography and lighting. I’ve been a teacher for over 15 years, so to teach filmmaking full time is a lot of fun. Besides the promotional circuit for Tales of Poe, I shot a short film called MONTY that will be premiering this year from director Billy Clift, based on actor Montgomery Clift. It was a beautiful art piece to film it as I was the cinematographer. I own my own photography business, too, so I am always working on new projects with other artists. My personal project that I am doing right now is my first photography book focusing on portraits. Another project is to catch up with sleep.